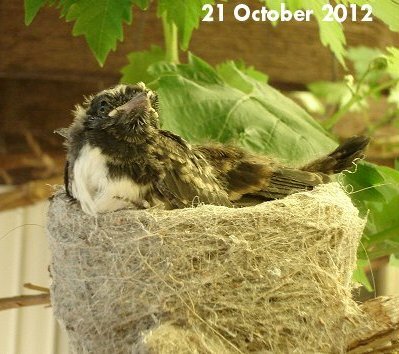 I’ve been privileged to have a couple of Willy Wagtails choose the grape vine under my veranda as a place to build a nest. I wasn’t too sure how it would work out with my coming and going, but we all seem to be getting along fine. 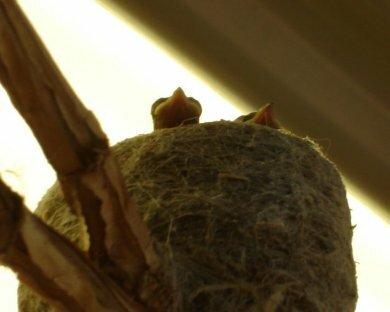 This morning I noticed a couple small beaks sticking out from the nest and thought I’d sneak a few quick photos of the chicks before their Mum and Dad got back with breakfast. 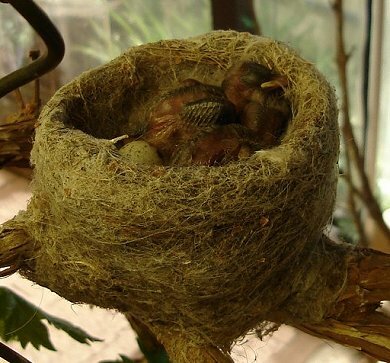 One of the eggs is still yet to hatch (and I’m guessing may not). Just 8 days have passed since I took the photos above – check out how much the little guys have grown in just over a week! 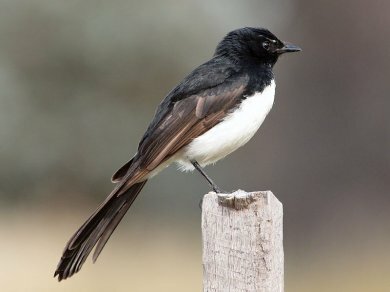 Willy Wagtails are common throughout Australia. They feed on insects and rarely sit still, continually flitting about or wagging their tail from side to side and twisting their body as they constantly look for food or signs of danger. They vocalise with a rapid and very loud “chit” type of noise when alarmed or in defensive mode, but also have a very musical call. The call varies from place to place, but around here at times its sounds exactly like the opening bars of the theme to Hawaii 5-0. It’s not unusual to hear them singing their little hearts out in the middle of the night. 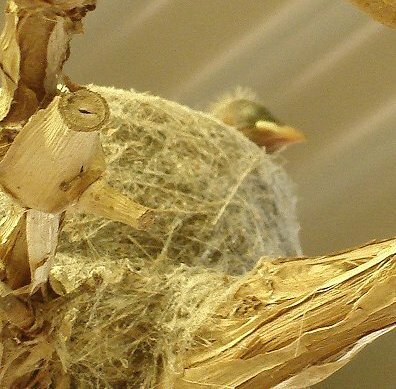 I was able to watch the pair build the nest pictured above – it’s quite an amazing process. They used bits of dried grass, very thin twigs and even some of Niki The Wonderdog’s hair; and it was all glued together with spider webs. They place the web over the materials and then wipe it with their heads to push and pin the material into place. According to the folklore of some Australian aboriginal tribes, the Willie Wagtail was the bearer of bad news and eavesdropped on conversations; so they would be very careful not to let secrets slip or talk about important topics when the bird was around. As most of my communication occurs via the keyboard, I guess I’m safe.